Tamworth had been such a beautiful girl. Slaughtered, salted, and hung air dried in the backyard olive tree for the last 8 months, she was now presented in wafer thin slices, nestled on a bed of the plumpest moist sultanas. A haphazard stack of buttered digestive biscuits to one side. A nasal delight snuffled greedily for the first half an hour as the afternoon sun gently warmed the plate. Some fruits were brought out to balance the palate: stewed apple and pear, lightly dusted with cinnamon. Home-made Damson Plum Jam to grace the biscuits. Accompanied by a small intense shot glass of cold pressed sun ripened blackcurrants, reduced almost to the point of syrup. My hearts desires satiated beyond my wildest expectations, I sat back and cleansed my palate with a light peppermint and green tea, before greedily repeating the gastronomic delight in delirious cycles until the plate lay barren. That one so young could attain such beauty. Can it ever be repeated I ask myself, whilst looking forward to next years pig. 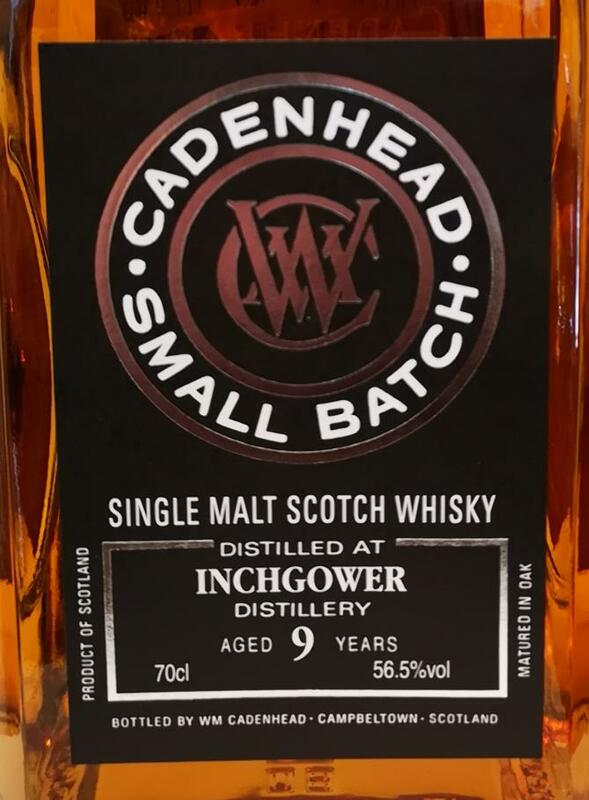 Inchgower, Cadenhead, 56.5%. 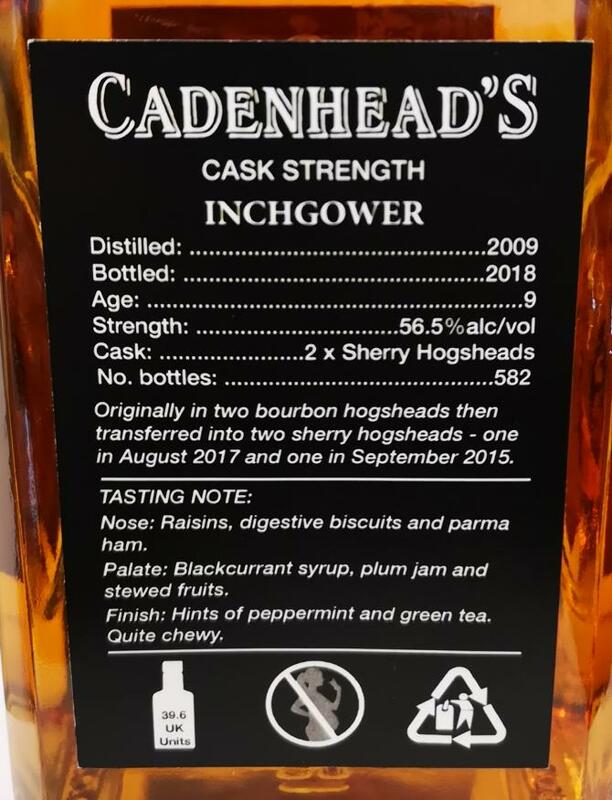 One ex-bourbon hogshead for 6yrs finished with 3ys ex-sherry, the other hogshead 8yrs in ex-bourbon followed by 1yr in ex-sherry, coming together for a marriage made in heaven at 9yo. Neither the bourbon or the sherry dominating, a perfect balance with many layered strata. 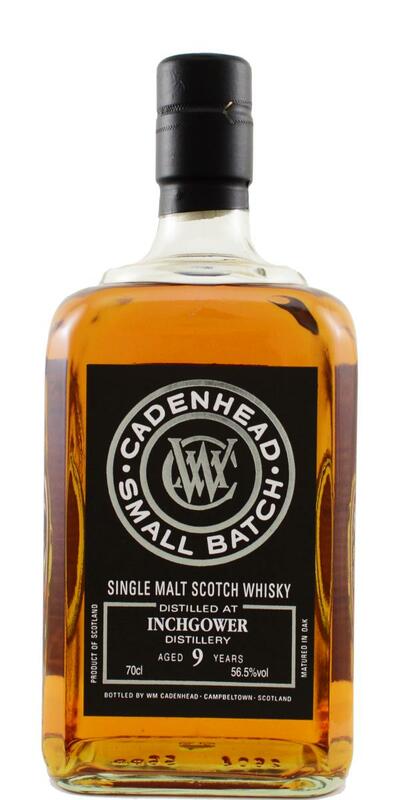 The colour alone indicates some quality casks along the line. I’m not normally one for finishes, but this has made me swallow my pride and given me an itch for the Inchgower. And so economical, a shining example of Independent mastery over pedestrian Official offerings. 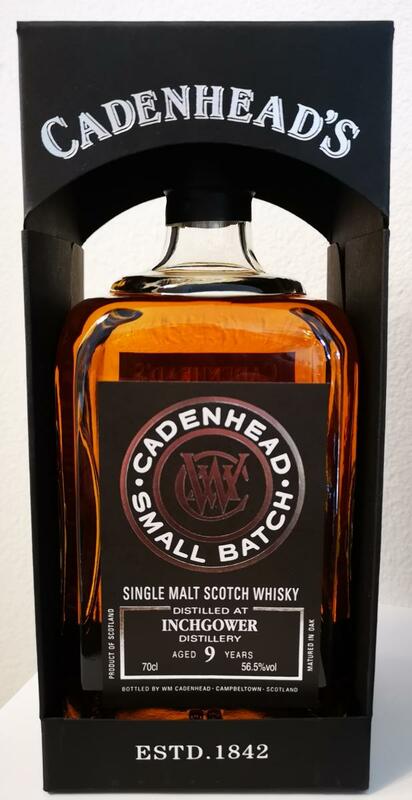 Magnificent, thanks Cadenhead. Many thanks to John Sherlock of Regional Wines not only for bringing it to my attention, but also for being being such an exemplar of flights of fancy. Sláinte. N: Raisin and nuts, cinnamon, nutmeg, plum, dry and hot, cocoa. F: Cinnamon hearts, nutty, dry, orange zest, milk chocolate. Notes: Much better with water, it gets creamier, softer and more accessible. It’s a decent malt, not overly memorable for me though. Blind tasting. A competent bottling and not as bitter and woody as I have read. Those notes are there but there is a lovely gentleness to the whole package that makes it an easier drinker than you might expect. Unlike anything I have ever tried. The cocoa flavour and taste is intense! Great whisky! A wonderful chocolate sweetness stretches from nosing to taste to the finish. Definitely worth trying.